Now it’s time to unify our efforts. 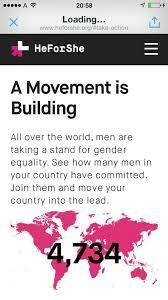 HeForShe is a solidarity movement for gender equality that brings together one half of humanity in support of the other of humanity, for the entirety of humanity. More info here. Watch the video below and write an article on your blog where you discuss the importance of such a movement and why you would support this or not.